There's a kind of 1970s American movie that's catnip to directors who grew up in the '80s and '90s while watching that sort of movie on cable TV and home video. It's visually and thematically dark, and very male. It has Rembrandt lighting and a palette dominated by paper-bag brown, burnt yellow, leprous emerald, and dirty cream. There's talk of honor and integrity and tradition, of old ways passing and a meaner, pettier, more chaotic, new way taking its place. It is an organized crime film, or a family drama, or a big city nightmare, or all three things at once. Nobody in it is conventionally likable. The hero, despite a certain reticence about selling what's left of his soul, soon figures out that to get ahead in this world, you have to be cold and calculating, and divest yourself of illusions. 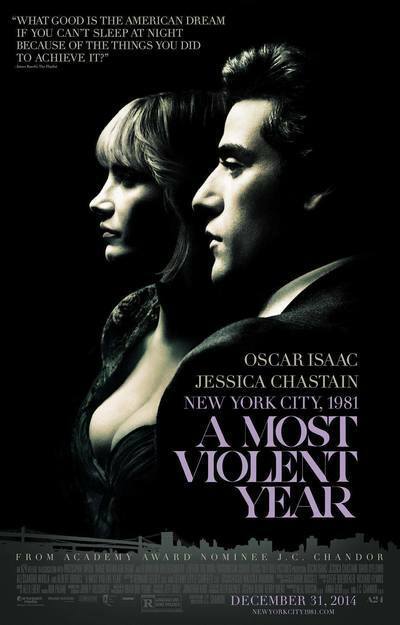 "A Most Violent Year," a 1981 New York period piece written and directed by J.C. Chandor ("All is Lost," "Margin Call"), is that kind of movie. Oh, boy, is it that kind of movie. It's quite good, for what it is. But it's that "for what it is" part that proves slightly exasperating. Oscar Isaac plays the hero, Abel Morales, who runs a heat oil company that he took over from his father-in-law. He just bought a port property and has a month to cobble together enough investors to pay for it in full, otherwise he'll have to eat the down payment and go broke. It's a major gamble that could pay off big if a few key things go right for him, but in this kind of movie, the "if"s rarely break the hero's way. He is under investigation for business, um, irregularities; the D.A. (David Oyelowo of "Selma") is riding him like an old dray horse. As if that's not enough pressure, Abel's company is under pressure from competitors. Worse, somebody's started hijacking his trucks: this happens in the opening sequence as he and his lawyer, Andrew (Albert Brooks, sly and smart and nearly unrecognizable, as is often the case these days), are delivering the down payment. We don't know who's behind the violence against Abel's company. We just know that he's scrambling to put this deal together and only has a month to do it, and that his wife Anna (Jessica Chastain, doing a credible Brooklyn accent), is not making things any easier for him. She's a tough-as-nails ally and confidant ("My husband is an honest man, don't mistake his honesty for weakness," she tells another character), as well as a wily bookkeeper. But she's also a borderline Lady Macbeth figure who often chides her husband for not being as hard as he should be, because this is a hard, shadowy world, and these are mean streets. The movie follows Abel and/or Anna as they try to get money to save their collective enterprise. Probably a third of the tale occurs during conversations between scowling men seated across tables in dimly-lit rooms. This is mesmerizing, up to a point, thanks to Isaac's cinematically borrowed but still palpable magnetism and the coiled intensity of the supporting players, and from cinematographer Bradford Young's lighting, which imparts a purgatorial gloom to conversations about capital and interest, respect and disrespect. The film's title refers to an actual, statistical designation: 1981 was the most violent year in New York City history up till that point, with 1,841 homicides (the number climbed through 1991 before starting to level off). Coupled with the retro look and rhythm and subject matter—the film is a dirty business movie, a crime film, a crusading New York DA story, and a visual homage to cinematographer Gordon Willis ("The Godfather," "The Conversation"), and a lot of other '70s-film signifiers as well—it all feels like a romanticization of a past which, through a twenty-teens, American middle-class filmmaker's eyes, looks like a Brigadoon of urban ethnic machismo. The movie is so funereal that at times it plays like a memorial service, not just for a particular kind of American drama, but for the male heroes who populated them: a snapshot of one of the last cultural moments when American men could be Men, in that old fashioned, two-fisted, furrowed-brow-and-whispered-threats sort of way. The American director James Gray also has made this kind of sideways homage, channeling the gangster pictures of Martin Scorsese and Francis Coppola and the big city thrillers of Sidney Lumet ("Serpico"), with a more meditative pace. Sections of this movie are reminiscent of Gray's "The Yards," which was equal parts "On the Waterfront" and "The Godfather," and his followup, the gangster picture/undercover cop thriller "We Own the Night" (which, like "A Most Violent Year," is fitfully excellent, but sometimes tries too hard to be a K-Tel Greatest '70s Macho Movie Hits album). Chandor's film ultimately has its own vibe, though, which is no small feat considering the heavy legacy it bears. The look and performances carry it. There's outstanding use of New York locations, some cunningly staged moments of suspense and violence, and smart deployment of TV newscasts as a mostly unremarked-upon Greek chorus. Even when the financial conversations and fine-grained discussion of traditions and codes become repetitive, and even though Chastain is slightly underused, "A Most Violent Year" makes an impression. It's still not the best tribute to American New Wave cinema in theaters this year: that would be "Inherent Vice," a meandering yet vibrant piece that seems to have fully absorbed all the different bits of popular art that fed its writer-director Paul Thomas Anderson's aesthetic, and that seems to have nothing to prove and is content to simply be. Gray's "Godfather II" inspired "The Immigrant" is also excellent, and likewise steeped in post-Vietnam America's cinema traditions, although it's gentler, told from a female perspective, and set more deeply in the past. Chandor, in contrast, doesn't achieve the same imaginative freedom in "A Most Violent Year," but he's a potentially major talent, emphasis on potentially. If this movie comes on television, you'll watch most of it, though there's a good chance that at certain points you'll wish you were watching the films that inspired it.